Please SelectPayment in 1 Installment.Payment in 2 Installments.Payment in 3 Installments.Payment in 4 Installments.Payment in 5 Installments.Payment in 6 Installments.Payment in 7 Installments.Payment in 8 Installments.Payment in 9 Installments.Payment in 10 Installments.Payment in 11 Installments. I agree to pay the reservation deposit ($ 109.9) for this order. Note: The reservation deposit is a Non-Refundable Deposit and will not be refunded if require cancellation. Please read the Terms and Conditions for more information. Another character who owns magical power to control water and a supporting role to her husband, Aquaman, is the Queen of the Sea, Mera. 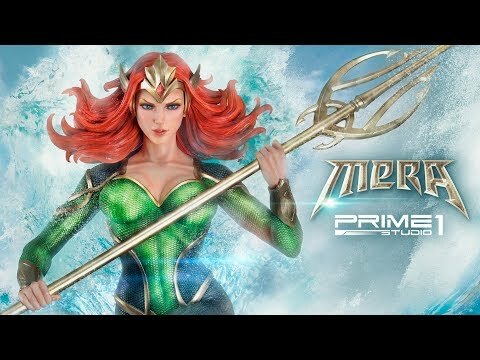 Prime 1 Studio is proud to introduce the splendid and dynamic Atlantean, MMDC-33: Mera from DC Comics. She has a distinct ability to create hard water objects, as well as superhuman physical strength and ability to adjust underwater environment. She received extensive training in Xebel, and it makes her into a master superheroine. This Museum Masterline statue comes with an iconic designed base with flying fish attached to the wave. The Queen of the Sea measure approximately 29 inches tall while holding her Trident. Aquaman fans, don't leave her if you want to add this beauty into your Atlantis collection!